Shark feeding time at Staniel Cay Yacht Club. The guys on the dock are cleaning fish and throwing the scraps to the sharks as spectators watch the swarming sharks. Note the pair on the paddle board. I wonder if a shark would know the difference between fish scraps and a toddler if the child fell in. On March 19th we saw Brandon off at the airport on Staniel Cay. Your humble narrator thought that a few beers from the Staniel Cay Yacht Club might help us melt from â€˜visitor vacationâ€™ mode back into cruiser mode. They did. But, alas, there are pressing needs. We must top off the water and get to an immigration office so Duwan can get permission to extend her stay in the Bahamas. There is an office in Georgetown and one in Stella Maris, Long Island. We need to get to one of these. On the 20th we make the short hop to Black Point to have supper on Moonshine with our buddy Bill. The forecast calls for NE wind tomorrow then calm for two days before another front comes through. We decide to use this wind to get to Georgetown. In the past weâ€™ve broken this trip up into a few days. We sail down the â€œbankâ€ side as far as we can, then on the third day go out the â€œsoundâ€ side. This time weâ€™ll do it all in one hop. We leave early heading out Dotham Cut. The wind is perfect. 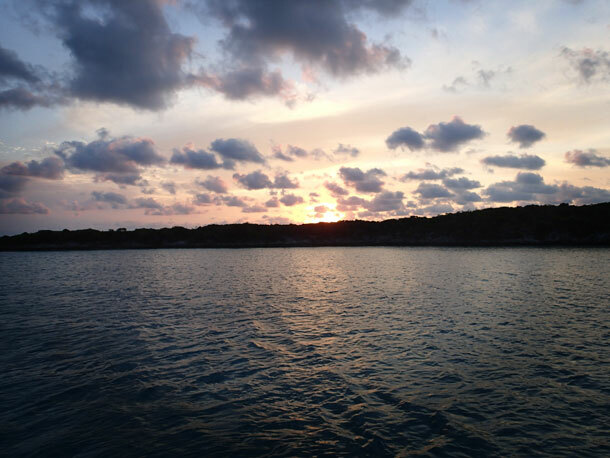 We sail a straight 46 mile shot to Conch Cay Cut. We turn and sail past the shallow reef where a cruiser boat recently ran aground. Then we motor-sail past the hundreds of boats anchored off the beaches of Stocking Island. Then itâ€™s into our favorite nook at Crab Cay well before suppertime. We spend the weekend here unwinding, and servicing the boat. I dink in to fill jugs and top off our water supply. On Monday we go to the immigration office where Duwan gets an extension for the rest of our season. Then we fill the dinghy with groceries and rum and head back to Blue Wing. Another horrific front is slamming the US east coast. Itâ€™s bringing hurricane force winds to the northeast and gale force winds to Bermuda. Our forecast is for SW winds of 20+ knots. We want to go east to Thompson Bay, Long Island. So on Tuesday we leave Georgetown hoping to use all this wind to our advantage. Only two other boats are stirring this morning. We see their sails. They have a four mile head start on us. We east sail out of Elizabeth Harbor, between the scary reefs, through Three Fathom Channel and out past the North Channel Rocks. Weâ€™re on our way. For the next ten miles there are shallow reefs scattered along our path on either side. Usually we have to zig-zag through this stretch to keep wind in our sails. We keep close eyes on the reefs and our GPS. Not today. We have the wind that was promised. And here on the lee side of Great and Little Exuma Islands the waves are only six inches high. We glide along at seven knots, with no bouncing at all. Itâ€™s like riding on some souped up Zambini. Itâ€™s cloudy, so we canâ€™t see any reefs until we zoom by close beside them. We round Hog Cay and turn a little further to the south. Here, out in the open, there is plenty of chop, but the wind is still behind us. We fly along. At one point our speed over ground is eight knots. The other two boats are also going to Thompson Bay. One is still far off, but we are gradually reeling the slower boat in. We catch up with it just as we round Indian Point. Oops. We left too early and covered our 36 miles too fast. Weâ€™ve arrived at Thompson Bay mid-afternoon and the wind hasnâ€™t shifted from SW to W yet. There is no protection, and we bounce around along with all the other boats here until dark. By then the wind has shifted west and we are protected by Indian Point. Aah. Sunrise at Crab Cay in George Town. It is off to Thompson Bay from here!